This morning we headed out as usual to the southwest corner. We first spotted a fin whale but moved on to try to find some whales and did we ever. We headed to an area where we’d seen some blows and where there were a lot of vessels. We started out with Tongs and calf who were just traveling along. At the same time there were three or four groups of 2-4 whales in the general vicinity. Several joins later we had a group of 10 animals, 8 adults and 2 calves, who were making huge bubble rings and open mouth feeding. I have never seen such a large group feeding together and we had some really wonderful looks at them. Inside one bubble ring we could see the fish swirling around! The group was made up of Tongs and calf, Geometry, Daffodil, Pepper, Weathervane, Osprey, Eraser, and Milkweed and her calf. We also go to see a great grey seal which eyed us warily before disappearing. This afternoon we headed again to the southwest corner. This time there was a lot less vessel traffic and we first stopped for some amazing minke whales. The lighting was just right that you could see the whole whale under the water and even the ‘minke mittens’ the splashes of white on each pectoral fin. There were once again a lot of seals in the area again. This time we found a large group of Osprey, Pepper, Daffodil, Eraser, and Weathervane feeding together and we stayed with them while they feed and travelled a little. We headed off for some other whales and found Tornado and her calf who were doing some flipper slapping and the calf even breached a few times. At this point things got a little crazy and the whales were traveling a lot, changing associations quickly and generally being great for whale watching, not so great for data collection. At this point we also spotted Dome, Pleats and Grackle, as well as an unknown whale. Again it was an amazing trip. Another boat headed out to the southwest corner of Stellwagen where there has been a lot of activity recently. We started our trip with a seal who had an orange/pink fish in its mouth. After getting a closer look at this other type of marine mammal we continued on to where we knew there were whales ahead. First, we spent time with Tornado and her 2014 calf who were deep feeding. They were taking about 3 minute dives with mom fluking quite nicely and the calf taking sounding dives. While we were with Tornado and calf, a minke whale popped up just a few feet away from the pair and another seal was spotted. At this point, we saw some flipper slapping ahead of us so we decided to check it out. We approached a group of 4 humpbacks who turned out to be Pleats, Jabiru, Glo-stick and Glo-stick’s 2014 calf. The group was taking fluking dives, likely deep-feeding. They generally spent less than 5 minutes on a dive. Jabiru’s dives were fairly lazy, very rarely showing the full underside of the fluke and keeping it fairly curled. The calf seemed disinterested in diving and spent some of the dives at the surface flipper slapping, rolling and spyhopping. While we were with this group, we spotted 2 more seals. At one point, one of these seals was directly in the line of movement of these four whales and did not dive to get out of the whales’ way until they were practically on top of it! Right at the end of the trip we had some great looks at the size of an adult’s flipper compared to the calf flipper we had been seeing the whole trip as one of the adults in the group flipper slapped once. Today was an absolutely beautiful day out on the water with bright clear skies and glass calm seas. For the 1:30 whale watch on the Aurora we went to the southwest corner. 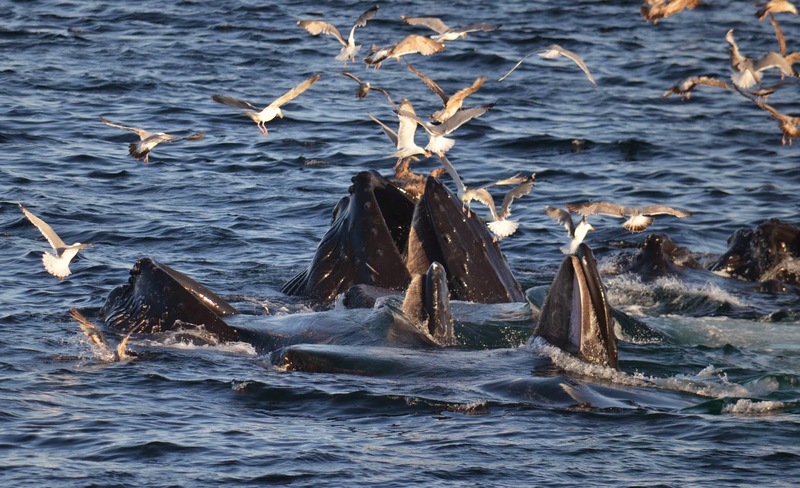 There, we had a phenomenal day of mom calf pairs, breaching, and tons of feeding activity. We initially found Glo-stick and her calf and everyone got extraordinary looks at the two of them because the water was so calm, we could constantly see them right below the surface next to our boat. The calf started breaching for us which was very exciting! 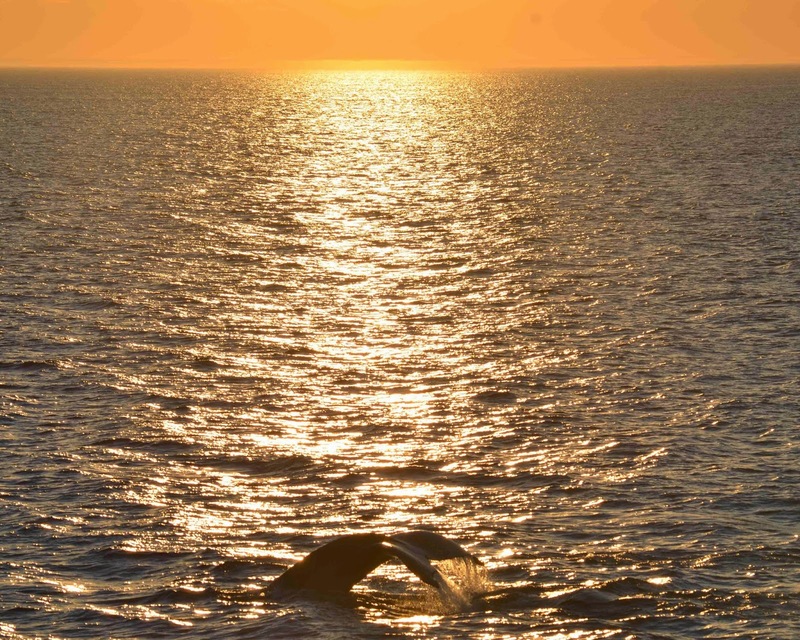 There were numerous blows in the area and we had our pick of which whales to start watching. Pleats came in and out of the area in one surfacing. 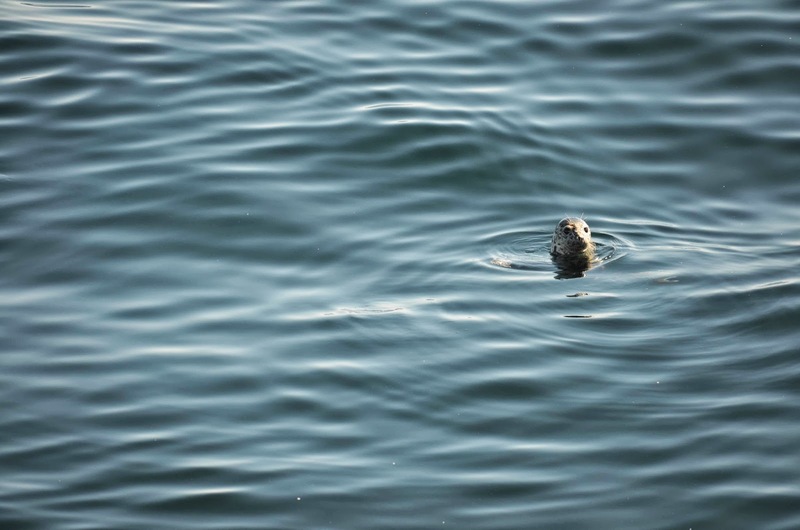 We also had 4 harbor seals seen during our trip today which was pretty exceptional. We moved onto Tornado kick-feeding with Grackle, with Tornado’s calf close by. Tornado was doing her signature flipper flares during her kick-feeding sequence, which was quite a crowd pleaser. There were several other whales feeding around us and there was always blows in every direction. Today was a beautiful day out on Stellwagen, and we had a fantastic whale watch! This evening’s 5:30 trip was literally one of the most phenomenal whale watches I have ever personally been on and it was such a memorable experience for all the passengers! We initially stopped on Tongs and her calf near the southwest corner but there were so many other blows in the area we continued a little further towards some feeding activity. There were about 20 feeding whales within a 2 mile radius and it was so overwhelming for everyone, it was difficult to keep track of who was who and where to look! We mostly stayed on a group of 6-8 humpbacks that would all surface together and share bubble clouds. Watching 6 whales surface together open-mouth feeding is always exciting. 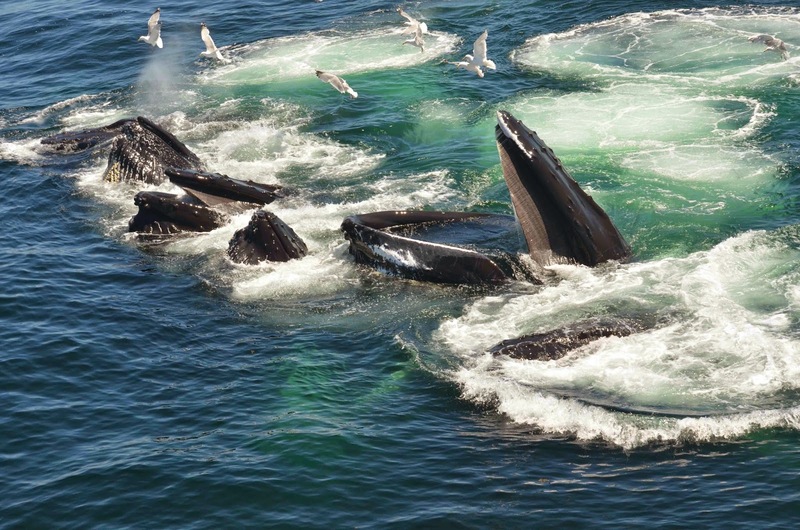 But there were another 5-6 whales that would join in and out of this large group, making quite a feeding frenzy! 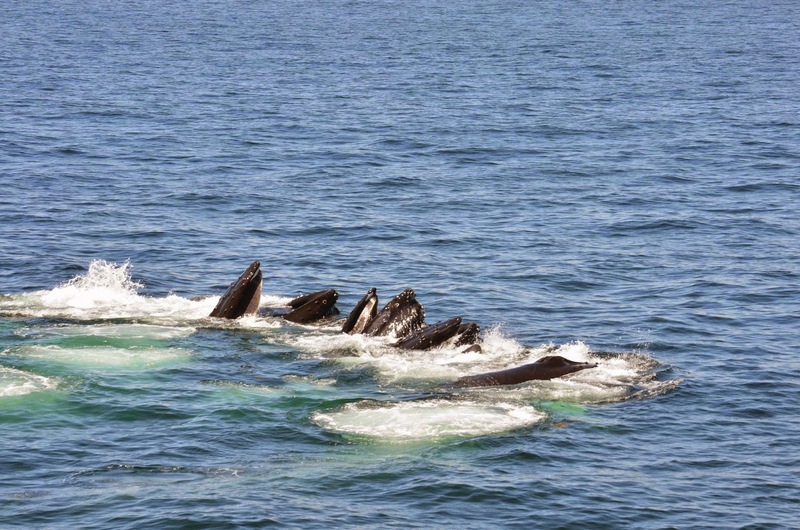 Some of the whales in this chaotic group consisted of Tornado and calf, Daffodil, Osprey, Eraser, Milkweed and calf, Cajun and calf, Geometry, Weathervane, Orbit, with Echo and calf close in the area. Echo’s calf was consistently breaching with head breaches and tail breaches while all the other whales were feeding. We watched all this commotion for quite a while, and when we couldn’t think the day could get any better, the magic began. Three humpbacks started breaching simultaneously right off our port bow!! I have seen double breaches before, but today we had triple breaching! There were full spinning-head breaches in unison, flipper breaches, head breaches, and back breaches. The passengers as well as the crew were in awe and completely dumbfounded. 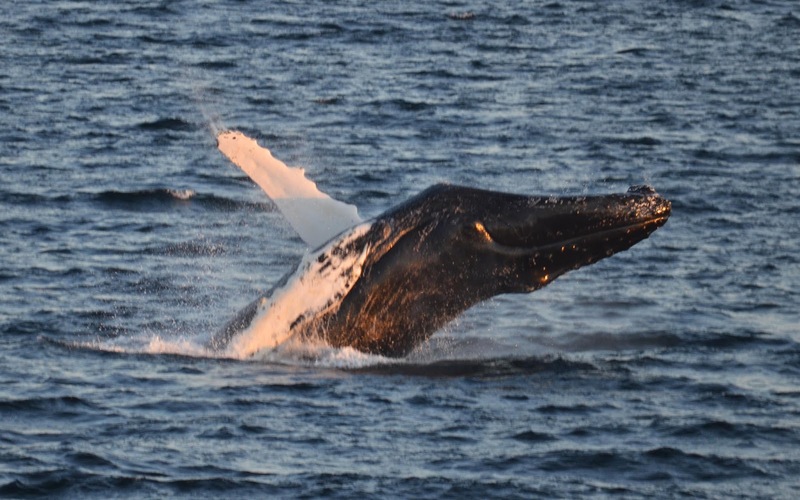 There was also some flipper slapping and the breaching seemed to be more of a communicative measure between the large associations of humpbacks. The three whales fully jumping out of the water was by far one of my best personal experiences whale watching thus far. We concluded the whale watch shortly after all the breaching activity, where there was still some activity around us and a great way to end the trip.